It can be hard to motivate a toddler to eat dinner some nights, so here’s something I tried recently. 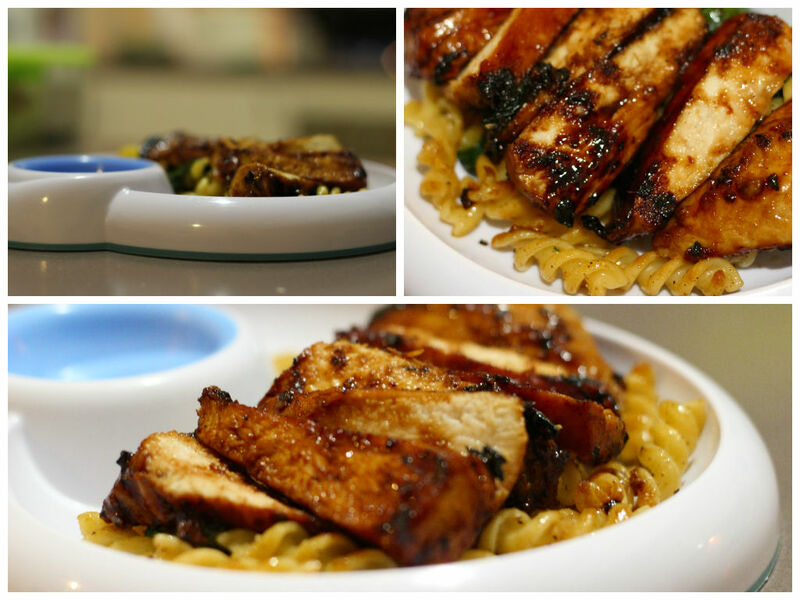 Home-marinated grilled honey soy chicken, served on a bed of mini fusilli tossed with garlic butter and baby spinach leaves. First, you need to marinate the chicken. Overnight marination is great but for the example above, I’d marinated the chicken in the morning at 10am and was grilling the chicken at 6pm. For more even cooking later on, use the flat part of your meat tenderiser to pound your chicken for a more even thickness throughout. Mix all the marinade ingredients together and coat the chicken. Leave the marinade and the chicken in a small bowl with a lid on and refrigerate until ready to cook. When ready to start cooking, get small saucepan of hot water going on stove. Cook mini fusilli. While fusilli is cooking, heat grill pan on high. If your grill pan is not non-stick, lightly spray the pan with cooking oil. When pan is ready, lay the chicken piece flat and cook on each side for 3 to 5 minutes, depending on thickness of meat. Glaze with honey as you go. When chicken has got 2 minutes to go, drain fusilli. Pan fry drained fusilli with black pepper and spinach leaves. Arrange chicken on the bed of pan-fried fusilli and serve. Bon appetit!